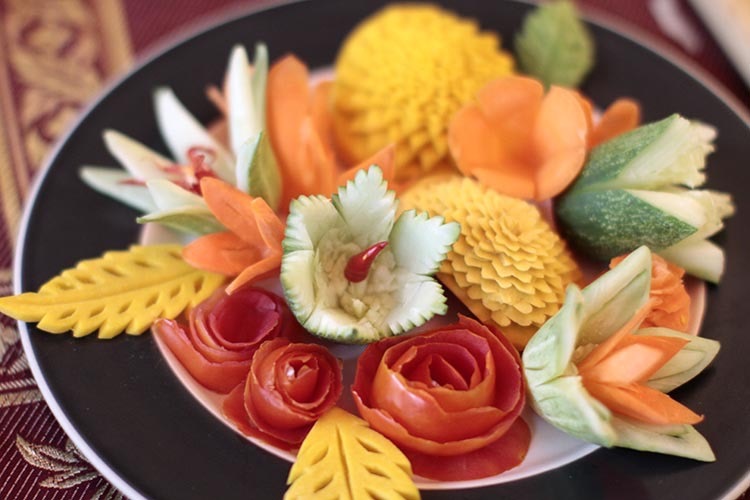 Since its beginning, fruit carving has been immensely popular during various periods of Thai history including present day. Our one day course teaches students the essential foundation of this historically signifcant art, covering a number of different designs. 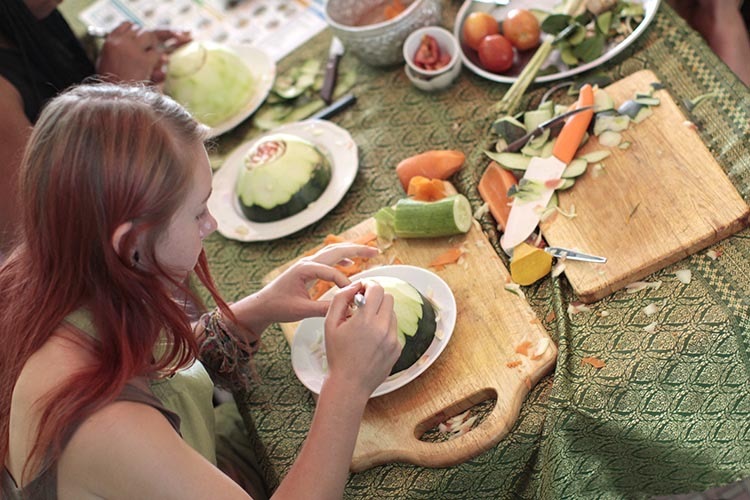 Students begin by learning basic cutting techniques, creating a basic leaf from cucumber. After the vegetable has been shaped, angular cuts are made to create the impression of divisions patterned after the structure of a real leaf. This first design is perfect first step for beginning and experienced students. Next students learn how to carve a leaf from a carrot, with slightly more complicated techniques required when compared to the cucumber. Students then move on to a basic flower design using a carrot as the base material. Floral designs are a degree more challenging than leaf designs, but most students are able to gain a solid command in a short period of time after following the instructor's guidance. After feeling comfortable with the basics, students move on to more complex designs. It should be noted that even beginning students with patience are able to successfully finish complicated designs in a single class. Patience is the key. Students move into a more complex floral design using raw carrot, a round flower design composed of numerous florets. Once students have an understanding of the carrot flower design, they move on to one of the most complex floral designs using raw pumpkin. After completing smaller sized designs, students are introduced to their first large sized carving challenge: a giant watermelon flower. In fact this design is perhaps the largest and most intricate of all the possible floral designs. 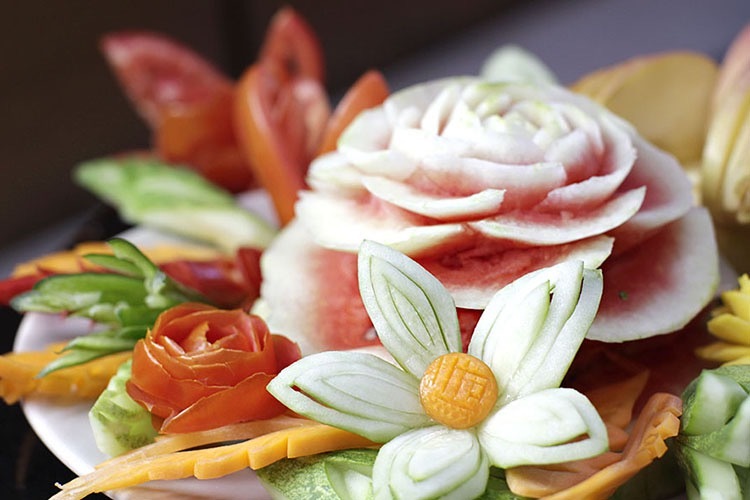 Also, the translucent nature of watermelon pulp adds to the beauty of the carving with colors ranging from deep red to pink, as well as white and light green. Completing the watermelon flower design requires several distinct stages. The first requires carefully shaping the general object, followed by beginning to render each petal individually starting at the center. After repetitive cycles to bring the petals to life, later stages consist of fine adjustments to create a fluidity throughout the carving and cohesion to the hundreds of cut marks that complete the design. After a short break students once again focus on smaller floral designs which complement the already finished watermelon design. This second set of small flowers are more complicated than the first set. Using uncooked pumpkin as the base material, students learn to create cascading miniature petals in circular patterns. More patience is required for these smaller designs as cuts are as small as five millimeters. 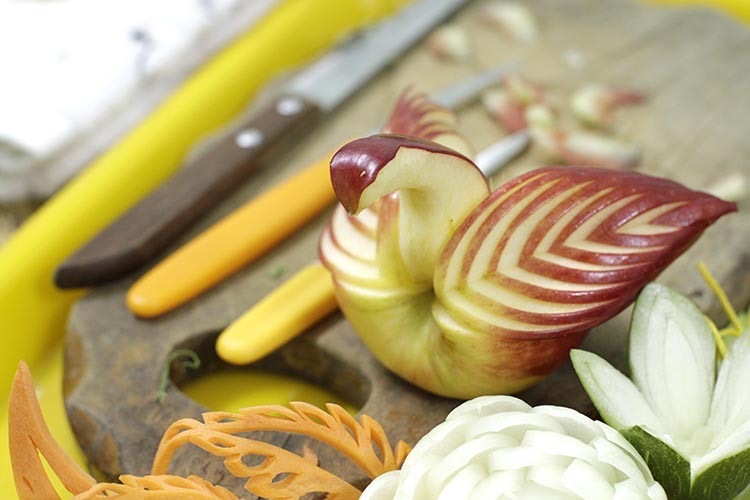 If time allows, students are instructed on how to create sculptures of animals such as an "apple swan". Animal carvings offer an interesting theme and add personality to collections of carvings. Students have time to revisit and practice any of the designs learned during the class, offering an opportunity to ask instructors for answers to questions that may arise when going back again and trying to put into practice everything learned during the class. Students and instructors review the completed sculptures. Instructors answer any remaining questions at this time and review specific cutting techniques if requested by the students. The class concludes with the opportunity to document the students' designs. In total, studets will have created carvings from tomatoes, apples, watermellons, cucumbers, and carrots. Finished sculptures are arranged for photographs and optional group photos. A well earned reward for the dedicated student.